Sign up for Broadjam today to follow Slick the Prodigy, and be notified when they upload new stuff or update their news! This is an album involving real experience and soul. 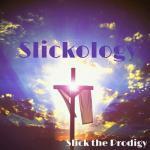 This is looking into the mind of Slick the Prodigy which is Slickology.